For other uses, see Edmund Ironside (disambiguation). Edmund Ironside (c. 990 – 30 November 1016; Old English: Ēadmund Isernside, Latin: Edmundus; sometimes also known as Edmund II[a]) was King of England from 23 April to 30 November 1016. He was the son of King Æthelred the Unready and his first wife, Ælfgifu of York. 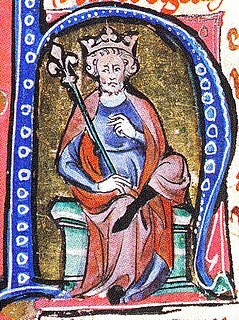 Edmund's reign was marred by a war he had inherited from his father; his cognomen "Ironside" was given to him "because of his valour" in resisting the Danish invasion led by Cnut the Great. Edmund was not expected to be King of England; however, by 1014 two elder brothers had died, making him the oldest male heir. His father, Æthelred, was deposed by Sweyn Forkbeard in that same year, but Sweyn died shortly thereafter, paving the way for Æthelred and his family to return to the throne, which they did but not without opposition. In the process they forced Sweyn's son, Cnut, back to Denmark, where he assembled an invasion force to re-conquer England. It would not arrive for another year. After regaining the throne, the royal family set about strengthening its hold on the country with the assistance of Eadric Streona (Edmund's brother-in-law). People who had sided with the Danes in 1014 were punished, and some were killed. In one case, two brothers, Morcar and Sigeferth, were killed and their possessions, along with Sigferth's wife, were taken by Edmund. Edmund unofficially became the Earl of the East Midlands and took Ealdgyth for his wife. Cnut returned to England in August 1015. Over the next few months, Cnut pillaged most of England. Edmund joined Æthelred to defend London, but Æthelred died on 23 April 1016, making Edmund king. It was not until the summer of 1016 that any serious fighting was done: Edmund fought five battles against the Danes, ending in his defeat on 18 October at the Battle of Assandun, after which they agreed to divide the kingdom, Edmund taking Wessex and Cnut the rest of the country. 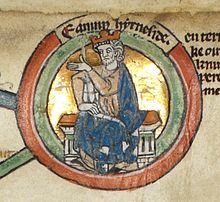 Edmund died shortly afterwards on 30 November, leaving two sons, Edward and Edmund; however, Cnut became the king of all England, and exiled the remaining members of Edmund's family. The exact date of Edmund's birth is unclear, but it could have been no later than 993 when he was a signatory to charters along with his two elder brothers. He was the third of the six sons of King Æthelred the Unready and his first wife, Ælfgifu, who was probably the daughter of Earl Thored of Northumbria. His elder brothers were Æthelstan (died 1014) and Egbert (died c. 1005), and younger ones, Eadred, Eadwig and Edgar. He had four sisters, Eadgyth (or Edith), Ælfgifu, Wulfhilda, and the Abbess of Wherwell Abbey. His mother died around 1000, after which his father remarried, this time to Emma of Normandy, who had two sons, Edward the Confessor and Alfred and a daughter Goda. Æthelstan and Edmund were close, and they probably felt threatened by Emma's ambitions for her sons. The Life of Edward the Confessor, written fifty years later, claimed that when Emma was pregnant with him, all Englishmen promised that if the child was a boy they would accept him as king. However that claim may just be propaganda. When Sweyn Forkbeard seized the throne at the end of 1013 and Æthelred fled to Normandy, the brothers do not appear to have followed him, but stayed in England. Æthelstan died in June 1014 and left Edmund a sword which had belonged to king Offa of Mercia. His will also reflected the close relationship between the brothers and the nobility of the east midlands. Sweyn died in February 1014, and the Five Boroughs accepted his son Cnut as king. However, Æthelred returned to England and launched a surprise attack which defeated the Vikings and forced Cnut to flee England. In 1015 Sigeferth (died 1015) and Morcar came to an assembly in Oxford, probably hoping for a royal pardon, but they were murdered by Eadric Streona. King Æthelred then ordered that Sigeferth's widow, Ealdgyth, be seized and brought to Malmesbury Abbey, but Edmund seized and married her in defiance of his father, probably to consolidate his power base in the east midlands. He then received the submission of the people of the Five Boroughs. At the same time, Cnut launched a new invasion of England. In late 1015 Edmund raised an army, possibly assisted by his wife's and mother's links with the midlands and the north, but the Mercians under Eadric Streona joined the West Saxons in submitting to Cnut. In early 1016 the army assembled by Edmund dispersed when Æthelred did not appear to lead it, probably due to illness. Edmund then raised a new army and in conjunction with Earl Uhtred of Northumbria ravaged Eadric Streona's Mercian territories, but when Cnut occupied Northumbria Uhtred submitted to him, only to be killed by Cnut. Edmund went to London. Æthelred died on 23 April 1016, and the citizens and councillors in London chose Edmund as king and probably crowned him. He then mounted a last-ditch effort to revive the defence of England. While the Danes laid siege to London, Edmund headed for Wessex, where the people submitted to him and he gathered an army. He fought inconclusive battles against the Danes and their English supporters at Penselwood in Somerset and Sherston in Wiltshire. He then raised the siege of London and defeated the Danes near Brentford. They renewed the siege while Edmund went to Wessex to raise further troops, returning to again relieve London, defeat the Danes at Otford, and pursue Cnut into Kent. Eadric Streona now went over to Edmund, but at the decisive Battle of Assandun on 18 October, Eadric and his men fled and Cnut decisively defeated Edmund. There may have been one further battle in the Forest of Dean, after which the two kings negotiated a peace dividing the country between them. Edmund received Wessex while Cnut took Mercia and probably Northumbria. On 30 November 1016, Edmund died. The location of his death is uncertain though it is generally accepted that it occurred in London, rather than in Oxford where Henry of Huntingdon claimed it to be in his sordid version of events, which included Edmund’s murder by suffering multiple stab wounds whilst on a privy tending to a call of nature. Geoffrey Gaimar states a similar occurrence with the weapon being a crossbow, but with a number of other medieval chroniclers including the Encomium Emmae Reginae not mentioning murder, it is thought Edmund’s cause of death may possibly have been caused by wounds received in battle or by some disease, but it is certainly a possibility that he was murdered. Edmund was buried near his grandfather Edgar at Glastonbury Abbey in Somerset. However the abbey was destroyed during the Dissolution of the Monasteries in the 16th century, and any remains of a monument or crypt would have been plundered and the location of his remains is unclear. In the view of M. K. Lawson, the intensity of Edmund's struggle against the Danes in 1016 is only matched by Alfred the Great's in 871, and contrasts with Æthelred's failure. Edmund's success in raising one army after another suggests that there was little wrong with the organs of government under competent leadership. He was "probably a highly determined, skilled and indeed inspiring leader of men". Cnut visited his tomb on the anniversary of his death and laid a cloak decorated with peacocks on it to assist in his salvation, peacocks symbolising resurrection. Edmund had two children by Ealdgyth, Edward the Exile and Edmund Ætheling. According to John of Worcester, Cnut sent them to Sweden where he probably hoped they would be murdered and forgotten, but Olof, King of Sweden instead forwarded them on to Kiev, where his daughter Ingegerd was the grand princess consort of the Kievan Rus'. The two boys eventually ended up in Hungary where Edmund died but Edward prospered. Edward "the Exile" returned to England in 1057 only to die within a few days of his arrival. His son Edgar the Ætheling was briefly proclaimed king after the Battle of Hastings in 1066, but later submitted to William the Conqueror. Edgar would live a long and eventful life; fighting in rebellion against William the Conqueror from 1067–1075; fighting alongside the Conqueror's son Robert of Normandy in campaigns in Sicily (1085–1087); and accompanying Robert on the First Crusade (1099–1103). He was still alive in 1125. In 1070 Edward the Exile's daughter, Margaret, became Queen consort to Malcolm III of Scotland. Through her and her descendants, Edmund is the direct ancestor of almost every subsequent Scottish monarch, every English monarch from Henry II onward, and every monarch of Great Britain and of the United Kingdom, down to the present day. Edmund Ironside is an Elizabethan play about him, which some critics believe to be a very early work by William Shakespeare. Edmund is played by John Horn in the 1970 television movie The Ceremony of Innocence. Edmund is one of the main characters in Justin Hill's novel Shieldwall (2011), first in the Conquest Trilogy. ^ Lavelle 2008, pp. 172-173. ^ Lavelle 2008, p. 172. ^ Lavelle 2008, pp. 169-172. ^ Henry of Huntingdon 2002, p. 15. ^ William Blackstone (1765) Commentaries on the Laws of England Book 1, Chapter 3: "Of the King, and His Title"
^ Numbers were not used to identify kings until well after the Norman Conquest of 1066, so their use to identify Anglo-Saxon kings is anachronistic. However, since Edmund I is usually identified as such, Edmund Ironside is sometimes referred to in the same manner. Henry of Huntingdon (2002). Historia Anglorum [History of the English People]. Lavelle, Ryan (2008). Aethelred II: King of the English. The History Press. Æthelred II, known as the Unready, was King of the English from 978 to 1013 and again from 1014 until his death. His epithet does not derive from the modern word "unready", but rather from the Old English unræd meaning "poorly advised"; it is a pun on his name, which means "well advised". Cnut the Great, also known as Canute, whose father was Sweyn Forkbeard, was King of Denmark, England and Norway; together often referred to as the North Sea Empire. Yet after the deaths of his heirs within a decade of his own, and the Norman conquest of England in 1066, this legacy was lost. He is popularly invoked in the context of the legend of King Canute and the tide, which usually misrepresents him as a deluded monarch believing he has supernatural powers, contrary to the original legend which portrays a wise king who rebuked his courtiers for their fawning behaviour. Ælfgifu of Northampton was the first wife of Cnut the Great, King of England and Denmark, and mother of Harold Harefoot, King of England. She was regent of Norway from 1030 to 1035. Eadric Streona was Ealdorman of Mercia from 1007 to 1017. Eadric was given the epithet "Streona" in Hemming's Cartulary because he appropriated church land and funds for himself. Eadric became infamous in the medieval age because of his traitorous actions during the Danish re-conquest of England. The Battle of Assandun was fought between Danish and English armies on 18 October 1016. There is disagreement whether Assandun may be Ashdon near Saffron Walden in north Essex or, as long supposed, Ashingdon near Rochford in southeast Essex, England. It ended in victory for the Danes, led by Canute the Great, who triumphed over the English army led by King Edmund Ironside. The battle was the conclusion to the Danish reconquest of England. Morcar was a thane (minister) of King Æthelred the Unready. He was given lands in Derbyshire in 1009, including Weston-on-Trent, Crich, and Smalley by King Æthelred in 1011 and 1012. He was also given the freedom from the three common burdens. He and his brother were executed in 1015. Morcar's brother's wife was later married to King Edmund Ironside. Very little is known for certain of the ancestry of the Godwins, the family of the last Anglo-Saxon King of England, Harold II. When King Edward the Confessor died in January 1066 his closest relative was his great-nephew, Edgar the Ætheling, but he was young and lacked powerful supporters. Harold was the head of the most powerful family in England and Edward's brother-in-law, and he became king. In September 1066 Harold defeated and killed King Harald Hardrada of Norway at the Battle of Stamford Bridge, and Harold was himself defeated and killed the following month by William the Conqueror at the Battle of Hastings. The Danish House of Knýtlinga was a ruling royal house in Middle Age Scandinavia and England. Its most famous king was Cnut the Great, who gave his name to this dynasty. Other notable members were Cnut's father Sweyn Forkbeard, grandfather Harald Bluetooth, and sons Harthacnut, Harold Harefoot, and Svein Knutsson. It has also been called the House of Canute, the House of Denmark, the House of Gorm, or the Jelling dynasty.